A teenager who developed a pioneering website in his bedroom has sold his business to a US computer giant for more than a million US dollars. 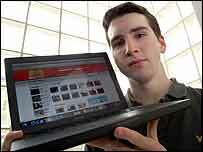 Kieran O'Neill, 19, developed his video streaming website HolyLemon.com in 2003 two years before YouTube was launched. The Bath University student has recently returned from the US after agreeing a deal worth $1.25m (£630,000) with the firm Handheld Entertainment. Mr O'Neill, of Winchester, Hants, set up his website while taking his GCSEs. The business administration student said: "With exams, I haven't really had time to celebrate yet. "The website started off as a way of showing Flash animations I made to my friends and just grew from there. "I designed the early sites in my bedroom at home and the trick was learning how to effectively stream user-generated video clips through the browser. "It is what you see everywhere now, but then it was a really novel idea - particularly for humour websites." As the site became more popular through word of mouth, Mr O'Neill began streaming user-generated funny video clips submitted to the site. HolyLemon.com went on to attract more than 50,000 users per day, becoming Google's first-ranked website for the search term "funny videos". Over the last year, Mr O'Neill has refused several offers for the business with Brad Greenspan - one of the early investors in MySpace - believed to be among them. He now holds shares in the parent company and can now invest in two new ventures he is currently working on.